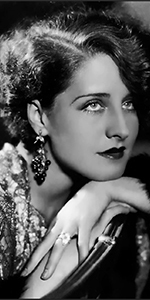 Norma Shearer was a very successful silent film star at the time of her imprinting ceremony in 1927, most often playing outgoing women in racy scenarios. With the introduction of sound, she gravitated toward more staid roles, for which she is identified today. Born in well-to-do circumstances to a depressive father and outgoing mother, young Edith discovered the theatre at an early age. When she announced that she wanted to become an actress, she and her mother (also named Edith), decided that, since Norma was not exactly a raving beauty (and had crossed eyes), they would provide her with style and wit and charm. The failure of her father's construction business in 1918 forced the family into poverty, but it also made Norma all the more determined to make it in showbiz. But how? Norma's uncle suggested that they head for New York, the center of the moving picture business. Edith sold her daughter's piano, a theatre owner provided a letter of introduction to Florence Ziegfeld, and off the family went (without father) in 1920. The meeting with Ziegfeld did not go well, with the famous producer reportedly calling the young woman "a dog." Trying out for extra work at the Universal lot in Fort Lee, New Jersey, Norma coughed to get the attention of the man doing the picking, who chuckled, "You win, Sis. You're in." While working as an extra with D. W. Griffith, the director told her to forget about becoming a movie star — her eyes photographed badly. Determined, Norma found an optometrist who provided her with extensive muscle exercises to try to improve her condition. The young Norma did these for hours every day. To keep head above water, she became a photographic model: "I could smile at a cake of soap as if it was dinner at the Ritz," is how she described it. Some film work lead to being offered a contract from a man named Irving Thalberg to come out to Louis B. Mayer Pictures in Hollywood on a six-month $250 per week contract. She accepted. Her first rushes were awful, until a sympathetic cameraman figured out a way to make her eyes photograph well. But still, she was flustered and nervous. Her director complained to Mayer, who called her into his office and read her the riot act — that she was screwing up her big chance. Norma's performance in Pleasure Mad (released in November, 1923), impressed Thalberg, who put her on the fast track. When M-G-M was formed in 1924, she was cast with Lon Chaney and John Gilbert in their first official production: He Who Gets Slapped (released in December, 1924). The film put M-G-M on the high road to success, and Shearer found herself queen of the lot. But she knew that fame was fleeting: Garbo had been hired. Sensing the need to develop her own unique screen persona, she begged Thalberg to give her better scripts. A fondness for each other developed instead, with the two wedded in 1927. When sound came in, Norma's brother Douglas led the studio into the new era as head of the sound department; he paid especial attention to the recording of Norma's voice; again, the determination: make it in sound films. Make it she did, with Norma winning an Academy Award for an early talkie, The Divorcee i(released in April, 1930). She continued to be a popular star, appearing in A Free Soul (which played the Chinese in June, 1931), Strange Interlude (which world premiered at the Chinese in July, 1932), and the first remake of Smilin' Through (released in September, 1932). The prestige picture period followed: The Barretts of Wimpole Street (released in September, 1934), Romeo and Juliet (which played the Chinese in May, 1937), and Marie Antionette (played the Chinese in October, 1938); but the weight of these costume dramas demanded a change, so she appeared in contemporary pictures also: Idiot's Delight (played the Chinese in February, 1939), and her best-known role in The Women (world premiered at the Chinese in August, 1939), and Escape (released in November, 1940. When Her Cardboard Lover flopped (while playing at the Chinese in July, 1942), she retired from acting. In retirement, Shearer became something of a recluse; Her husband Irving had died tragically young in 1936. After she quit the screen, she married again, and eventually dropped the Hollywood scene altogether. She died in 1983 at the age of 80. Grauman's Chinese Theatre, Hollywood, California. 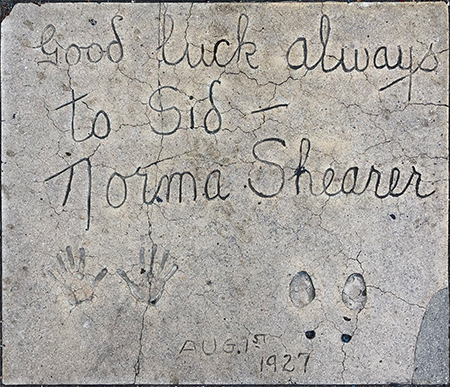 Norma Shearer Forecourt ceremony, Monday, August 1, 1927. 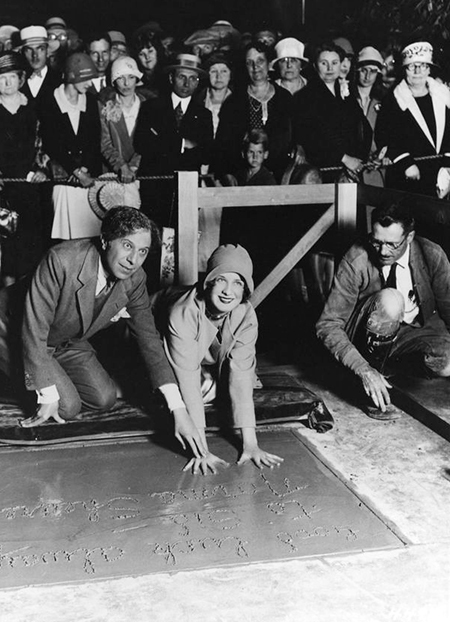 Sid Grauman helps Ms. Shearer make her impression, as cement artist Jean Klossner looks on.